Find out more about the 11+ English exam and how Bond 11+ English resources can support your child on their path to exam success. 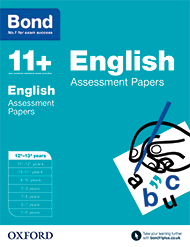 11+ English exam papers are timed and usually last between 45-60 minutes. Children should practise with timed 11+ mock test papers, as well as working through non-timed practice, so they can see what they are able to do within a given time frame. Here are some ideas for you to try at home in order to help your child prepare for their English 11+ exam. Ensure your child is reading regularly. Reading is a key skill so spend time reading with your child during the summer. Ask them to explain what they’re reading so you can gauge their comprehension skills. Keep a diary or write a summer project to help your child improve their writing skills. Use this opportunity to develop their vocabulary and spelling skills. Use quizzes, dictionary games and crosswords to further extend your child’s knowledge. Establishing a regular routine of bedtime reading, if that’s not already part of your child’s life. Encourage a wide range of reading material to ensure your child is exposed to a variety of authors and styles as this will help to build their vocabulary. As well as factual books and fiction you might want to include diaries and newspapers written especially for children. Planning some quiet, uninterrupted reading and writing sessions each week. Aim for one reading and one writing session per week, although you might want to do more if English is your child’s weaker subject.